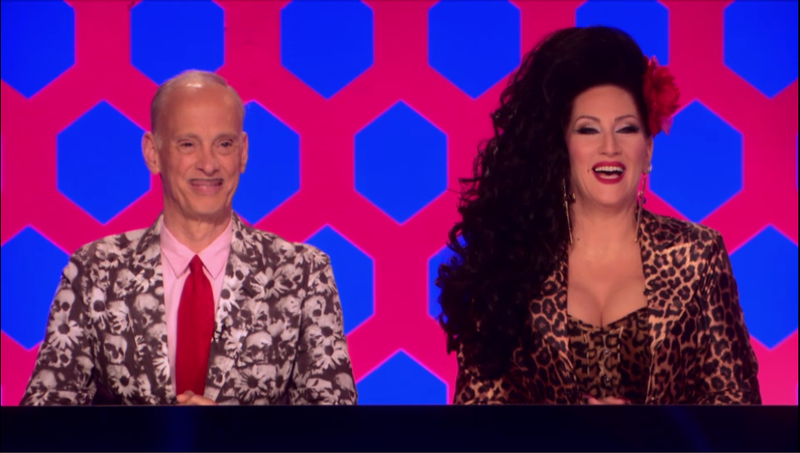 On Monday night, beloved director and gross-out camp icon John freaking Waters was one of the guest judges on Drag Race. In honor of his blessed presence, RuPaul brought out the big guns: the queens were tasked to reenact scenes from iconic Waters movies starring none other than Divine—in musical form. It resulted in some of the funniest segments in the show’s history. Here’s a question: can we permanently get rid of Ross and... that other new guy with the clothes, and replace them with John Waters? The jokes were to die for—LITERALLY: “Bring back my pussywillows.” And the judges landscape has been seriously lacking in funny without Santino’s interminable hilarious bitchiness (Also, out with these pop stars who say it’s their dream to be on the show and then offer nothing that shows they even watch it, even though I love Ariana and Demi.) Alas, they’ve all been resting on the humor of Ru and Michelle Visage alone. Ru as a black light painting of herself!